Home / herbs / Doing the Happy Soap Dance for Oct. Challenge!!! OK I am soooo pleased with how these came out- Woohoo doing the happy soap dance but read on for the specifics for the challenge I made the soap for. It came out so much better than I thought! I try to participate in Great Cakes Soap Challenge almost every month and was happy to fit this challenge into my busy schedule. Amy Warden facilitates these every month for US soapers and also international soapmakers as well. She scopes out new things for us to try as seasoned soapers in the areas of color design and techniques. I am amazed by what she finds and helps us all to push ourselves and try new things. I am always amazed by all the contributions in these monthly contests. She also gets sponsors who offer prizes for the winners of the challenges where we all get to vote and choose the best one. So onto this month’s challenge which is to use an alternative liquid in place of all the water and to use only natural colorants and essential oils for scent. We also were required to do some research as to what the benefits of using that particular liquid added to the soap and even if it was just label appeal so this was a different spin on the challenge. I chose to make and use Chamomile Tea as my liquid. Yes I could have chosen beer or wine or milk but wanted to try something I have never done before. I brewed up an extra strong pot of Chamomile Tea and did some digging while it was brewing. 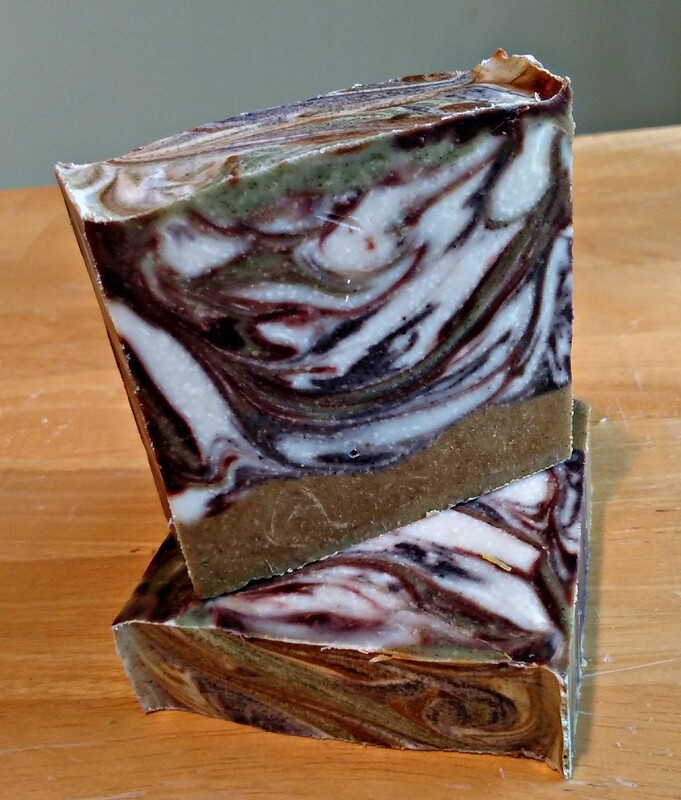 I also worked out what to use for coloring the soap- chamomile powder for the bottom and used nettles and alkanet powders for the swirl. Here is what I have found out – the word Chamomile comes from Greek origin that means “earth apple on the ground”. Chamomile flowers do have an appley scent and look like small daisies. The Essential Oil comes from the flowers. Both the herb and the essential oil have benefits ~ anti-viral, anti-fungal, anti-microbial, anti-spasmodic and anti-inflammatory. There are two kinds of Chamomile, Roman Chamomile and Blue German Chamomile and both essential oils are expensive. As I was making soap my friend suggested I sub Lavender and Palmarosa essential oils and that worked very well and smells pretty awesome. I used Chamomile Tea for my liquid and researched the following skin benefits from the tea. Chamomile is also used in blonde hair treatments and will also lighten and brighten hair if used in rinses. Maybe use the tea in a natural cider vinegar rinse or instead of. I will need to try this sometime. Chamomile Essential Oil in the bath also has a relaxing, calming effect like Lavender. Note those that are allergic to rag weed or pollen could also have a reaction to use of chamomile. I have also seen cautions for pregnant women and also if on blood thinners. Oh, this is very nice!!! So many benefits to chamomile! And your soap is stunning. Love the contrast of the uncolored soap against the alkanet, and the nettle and chamomile powder add yet another dimension to the swirls. Great job, Marilyn! I love the contrast in these colors. They made for some really cool looking swirls! =) And Chamomile Tea for the liquid does sound delectable.